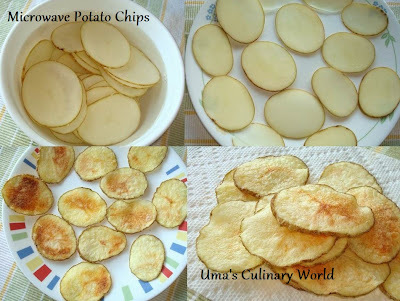 An all time favorite snack - Potato Chips, but cooked in a microwave. Less oily and not deep fried. In a big bowl, add about 1/2 tsp salt and mix well. Wash the potato well. No need to peel the skin. Thinly slice the potato using a knife or a mandolin slicer. Add the slices to the salty water. Set it aside for 15 - 20 minutes. Drain the water and rinse the slices in water 2 - 3 times, so that the water turns clear. Place the slices on a clean kitchen towel and pat them dry. Grease a microwave safe plate with cooking spray or oil. Arrange the slices on the plate. Grease the slices with cooking spray or brush each slice with oil. Sprinkle little salt and microwave for 2 minutes. Along with salt, you can sprinkle any other seasoning of your choice. Flip the slices and microwave for another 2 minutes or until potato slices turn slightly brown and crisp. Some slices might turn crisp quicker than the rest. After cooling completely, the chips will turn more crisp. Repeat this process for the remaining slices. Let the chips cool completely and store them in an airtight container. Enjoy healthy Potato Chips with sandwiches or as an anytime snack. Wonderful and lovely chips. Very healthy. I just love this guilt free chips, feel like munching again. Thanks for the recipe uma. It's great. Wow! Will try it out at once! Uma will it get crisp by 2 minutes i had tried once (not from ur space though) it took long! Hi Aps! For me, it took 4 minutes, as I have mentioned above.